When NASA-NOAA’s Suomi NPP satellite passed over Tropical Storm Tapah on April 28 imagery revealed a developing eye surrounded by a thick band of thunderstorms. A tropical storm warning is in force for Saipan and Tinian as Tropical Storm Tapah moves north through the Northwestern Pacific Ocean on April 28. When NASA-NOAA’s Suomi NPP satellite passed overhead and, imagery revealed a developing eye in Tapah. In addition to the tropical storm warning, a typhoon watch is in effect for Alamagan and Pagan as Tapah is expected to continue in a generally northerly direction over the next couple of days. 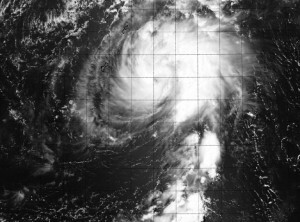 A typhoon watch means typhoon force winds of 74 mph or greater are possible within 48 hours. A tropical storm warning means tropical storm force winds of 39 mph to 73 mph are possible within 24 hours. NASA-NOAA’s Suomi NPP satellite captured an image of Tapah as it passed overhead on April 28 at 03:21 UTC (April 27 at 11:21 p.m. EDT) and the VIIRS instrument aboard captured a visible image that showed an eye surrounded by bands of thunderstorms around the center of circulation, and a large band of thunderstorms wrapping around the eastern quadrant and spiraling into the center. On April 28 at 1500 UTC/10 a.m. EDT, Tropical Storm Tapah had maximum sustained winds near 50 knots/57.5 mph/92.6 kph. It was centered near 14.2 north latitude and 147.4 east longitude, about 121 nautical miles/139 miles/224 km east of Andersen Air Force Base, Guam. Tapah is moving north at 6 knots/6.9 mph/11.1 kph and the Joint Typhoon Warning Center expects a turn to the northwest. The storm is expected to strengthen into a typhoon sometime on April 29.